In 2009, when the Village Hall was refurbished, the Hall Committee generously gave Bishopthorpe Local History Group the use of a small upstairs room in which to keep its Archive. Since that time, members of the Group have been cataloguing the collections and putting them in some order. We are nowhere near finished as the work is very time consuming and new material continues to roll in. However, we are keen to open the Archive to members of the public who may be interested in researching or viewing the fascinating Bishopthorpe-related collections. After all – you never know what you might find! What is stored in the Archive? It is undoubtedly eclectic and exciting and reveals many unexpected facets of Bishopthorpe’s history. A 19th century Parish Magazine notes the formation of the local football team in 1895; the deeds of one 18th century house unearths a mint-still in the grounds; Village Hall Minutes of 1916 record a war shrine erected to those serving overseas; programmes and scripts of the Bishopthorpe Players show that “am-dram” was alive and well in the village long before the Ebor Players started performing; and the York Society of Model Engineers can be seen on DVD running their miniature railway behind The Poplars (now the Social Club) in the early 1960s. Who provided the various collections? They were mostly given by Bishopthorpe residents, former residents and organisations. For example, the late Mr. Tom Evans of Beech Avenue was much involved with the Sports and Leisure Committee, allotment and garden committees and local youth organisations, (he was Hon. Secretary of the Bishopthorpe Youth Club in the 1960s). More personally, he enjoyed ballroom dancing, which was once very popular in the village. His participation in these and other activities resulted in a large and valuable collection of correspondence and ephemera which reflected his varied interests and concerns. Tommy gave his collection to the Group specifically to preserve aspects of village history that might otherwise be forgotten. Not quite the thing to wear for a jiving session in the Village Hall! 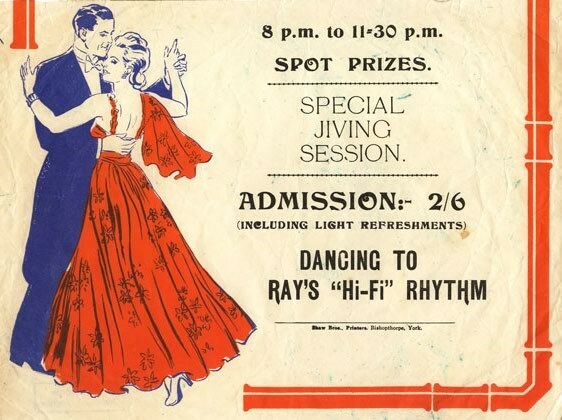 A dance poster from the Tommy Evans’ collection. As well as these original collections, members of the Group have also collected, transcribed and digitised information on the village. There are copies of maps; hundreds of local photographs; recorded interviews with residents; resources such as Bishopthorpe entries in trade directories and newspapers covering the 19th century to recent times. There are digital copies of The Valuation Office Survey, 1910 – 1915, which provide descriptions of every building in the village at that time. I should not forget that we also store copies of Link magazine from the 1970s until 2012. 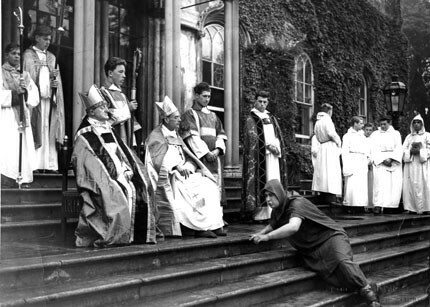 The Bishopthorpe Pageant performed on the steps of the Palace in July 1954. One of the many hundreds of photographs held in the collection. Courtesy of the Northern Echo. We have sought advice from archivists at York City Archives and the Borthwick Institute who have generously given of their time and visited our room. As a consequence, the original material is gradually being stored in archive – quality boxes and sleeves. These are expensive so donations are always welcome and gratefully received. I am not able to put up the complete catalogue on this website but, by clicking on the tab, ‘Archive Listings’ above, a subject list opens which gives a good idea of the Archive contents. Throughout the list, pop-up images can be viewed of some items. This work is ongoing and will be updated periodically. Visitors are welcome at the Bishopthorpe Community Archive on any Monday afternoon (Bank Holiday Mondays excepted), 2.30 – 5.00 p.m.
historygroup@bishopthorpe.net to make an appointment.